Truly one of the best values at Waterscape, this unit has just enjoyed many updates for the 2018 season. Brand new Italian leather queen sleeper sofa, chair and ottoman dial up the luxury level in these already stylish digs. Relax on the new balcony oasis, surrounded by palms...the new rugs, table and chairs create a cozy courtyard feel. No Gulf view here, but you won't mind! You are surrounded by beautiful art and decor and have plenty of extra money for shipping and dining. Experience a slice of La Dolce Vita 'The Sweet Life' when you stay in this professionally decorated contemporary condo. Colorful and fun with 5 flat screen TV's! Two suites with garden tubs and separate showers. Granite & stainless kitchen. Dining table seats 6 with additional counter eating area and outside balcony dining area. Upgraded lighting adds ambiance galore. Super cute kids bunk room with door, lighting and double flatscreen TV's. The ultimate vacation destination on the Emerald Coast for those who truly appreciate luxury resort accommodations for the entire family. From the lush landscaping to the sugary white sands of it's 490 foot beachfront, Waterscape delivers what everyone is looking for in a family vacation. There’s really nothing else quite like it. As if the beach is not enough, the beautifully landscaped split-level courtyard is a 10,000 sq. ft. water park perfect for sunning, swimming and people-watching. Whether it's a splash in the main pool with it’s stunning 10” waterfall, zero entry point and kids rope challenge, a float on the LAY-Z-RIVER, a dip in the quieter upper pool or playing with your toddler in the kiddie splash pad zone, Waterscape has it all. Enjoy the convenience of the cabana style snack bar serving sandwiches, snacks and cocktails. Or fire up one of the gas grills for a family Bar-B-Q poolside. Resort sponsored children’s activities add to the fun. You may also enjoy the state-of-the art fitness center set behind the waterfall with a view of all the action. Or relax in an over-sized hot tub nestled in its own private arbor. Conference room, kids’ game room and secure covered parking are also available. Walk to The Fishing Pier, newly remodeled Gulfarium, restaurants and shops. Drive 10 minutes to Destin, voted 'Best Beach Town' by Southern Living Magazine readers! Fans of deep- sea fishing refer to Destin as simply the 'World's Luckiest Fishing Village'. Golf Digest lists Destin in its 'Top Ten Best Golf Towns in America'. 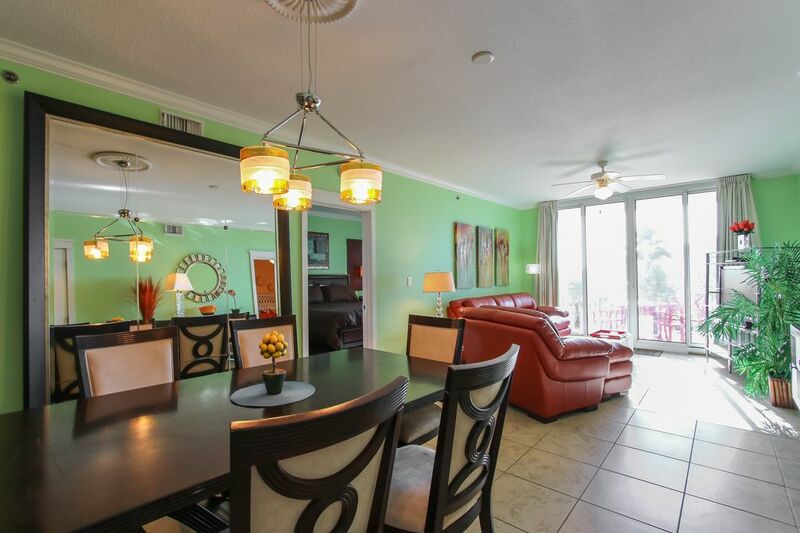 Explore the Emerald Coast from this convenient location. If the calendar shows full please inquire as Pinkie has other units available for an exciting and affordable vacation for you and your family. We are the Federico's...David and Mary. We actually bought our Waterscape condo before it was even built! It turned out even better than promised. We love sharing it with families like yours! There is nothing like it on the Gulf Coast! Lots to do! Walking distance to restaurants and stores. Beautiful sugary sand beaches, sun, fun and more. That's life in sunny Florida! Stainless Steel Side By Side With Water In Door. Stainless Steel Appliances and Granite Counter Tops With Breakfast Bar. Five Flat Screen TVs Throughout! 42" TV In The Living Room, 32" TVs In The Two Bedrooms & Two 19" TVs In The Private Bunk Room. Ocean Views From Your Balcony. Outdoor Dining On Private Balcony Seats Six. There Are a Total of Four Pool Areas Including: LAY-Z-RIVER, Main Pool, Adult Pool and Kiddie Pool With Splash Pad for Toddlers. Drive up covered parking garage, Lay-Z-River float, 3 pool areas, waterfall, state of the art fitness center, game room, Kids'Klub, water sports. Great for families. Nice pools and short walk to beach. Great rental for families. All of our kids really enjoyed the pools and the beach was just a short walk from the condo. Plenty of room inside the condo and the kids really liked having their own spaces. Only negatives were no coffee filters for coffee maker, no extra toilet paper or paper towels, and the mattress on the king size bed is lumpy. Loved the condo. Very clean and comfortable. Plenty of room for my family. This is the second time I have stayed here. Last time I stayed was 4yrs ago. It was just as great then as it is now. We will be making this a regular place to stay. The amenities are a bonus the pools are great. Plenty of room for everyone to enjoy. Beach access is awesome especially the ramps make for easy access. Plenty of grills pool side that are cleaned and taken care of daily by staff. Dealing with the owner was a breeze and made the booking process effortless. Enjoyed the entire stay and booking was great. Can't say enough good things about it. We loved how convenient the location is to the beach and pool! Also the condo is so close to the airport! We hope to return! Pinky was great to work with. The condo was nicely decorated and very clean. We can't wait to rent from her again. Except for the rain, it was a perfect vacation. Thank you for the awesome hospitality. From the time of arrival everything was just as described. There was a issue, due to no fault of the owner, and she quickly helped resolve the issue. Great customer service. The property and all amenities were great and detailed correctly in the listing description. Good location of complex and near a lot of activities like Marina, Restaurants, and the Boardwalk. That's if you were tired of using Waterscape's amenities which were excellent. Pinky provided a list of favorite restaurants and area attractions and it was a help, especially the first night looking for a restaurant. We will return when we can and will definitely see if Pinky has anything open when we can return. Great winter out of the snow! This is our second winter staying in this wonderful condo! It has beautiful decorations and everything was very clean. The bed is like sleeping on a cloud. Great rates too! The owners are awesome! So nice! We are looking forward to staying here next year! Deposit is due at booking. 1/3 of rental payable with MC, Visa, Check or Money Order. Balance due one week prior to rental payable with Check or Money Order.